Saturday, June 1, I attended Helen Woodward Animal Center’s (HWAC) 25th annual Spring Fling at the Fairbanks Village Plaza in Rancho Santa Fe. Guests entered on a red carpet, where they posed with a HWAC dog for paparazzi-esque pictures. Inside, the space was transformed into an elegant affair, with modern white and black benches and tables popping with emerald green accents. For the first half of the evening, we perused the silent auction items, mingled, and enjoyed the live music. I ran into Debra Skiba, a fellow event committee member who teaches tango at Tango Del Ray. I also ran into Dr. Perry Mansfield, a Senta Clinic doc who has a dog from HWAC and was kind enough to store all of the wine for HWAC’s opportunity drawing in his wine cellar. 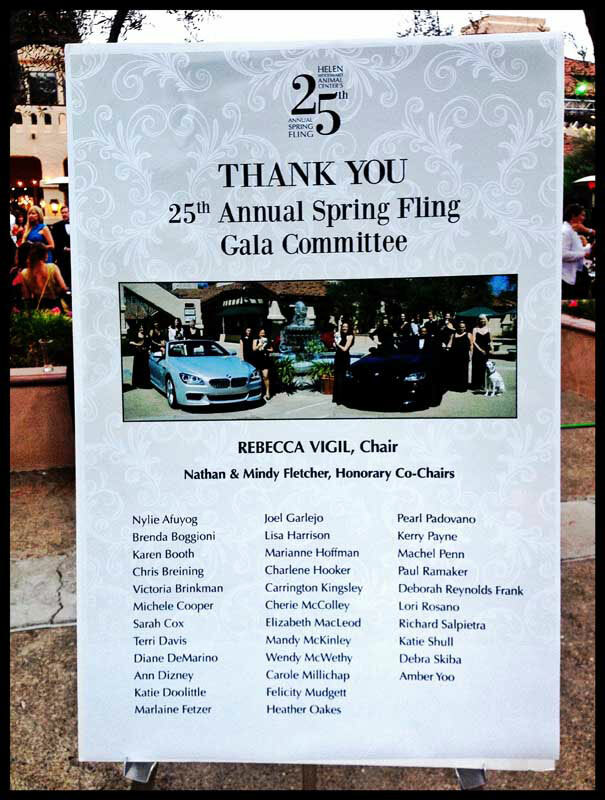 A plaque thanks the HWAC Spring Fling committee members as guests enter the live auction area. I'm honored to be listed here. As the silent auction drew to a close, the crowd moved into the fountain courtyard, which was filled with dining tables facing a stage and bordered by booth after booth of cuisine from local restaurants. While the band played, we sampled the food and talked with our tablemates. I felt very lucky to be sitting at a table with Kristi Krause from American Idol, Katie, a HWAC employee, and Nylie Afuyog, a local jewelry designer who served on the event committee with me. Kristi is a huge animal lover and she performed a few numbers on stage. She has such a lovely voice. Katie and I talked about how she loves her job at HWAC. She works in the boarding facility, where community members can board their pets while they are traveling. It sounds like the dogs have an awesome time when they stay there. The highlight of the night for me was the live auction, mainly because one of the auction items was donated by none other than Dr. Ian Purcell, a Senta Clinic doc! Dr. Purcell donated a ride in his Stearman biplane. Any airplane enthusiast would be beyond thrilled to touch a Stearman, let alone ride in one. You usually only see Stearman's in museums or in aerial shows. "It’s not clear just how many Stearmans survive today, aviation historians say. The federal registry lists about 2,000, but many of those are little more than a few unassembled parts or just exist as a piece of paper. Knowledgeable enthusiasts estimate about 1,000 Stearmans around the world are still flying," states the National Stearman Fly-In. The item raised $3,500 for the Center’s orphaned animals. At the end of the night, I was delighted to discover that I’d won a silent auction item! Next year, The SKY Team will have the naming rights for the event’s signature cocktail! Missed my previous posts about planning Helen Woodward Animal Center’s Spring Fling? Here they are: Posing with Puppies and Amber Spotted in Ranch & Coast. Our New Office in 4S Ranch! Amber N. Yoo, M.B.A. June 13, 2013 SKY Facial Plastic Surgery, Inc.